Man, it's been over a month since I've posted a new image. It's because I've been working on a ton of illustrations that I can't post yet. Strictly hush, hush, you know? Anyway, here's a new one. Take a look at this stewardess image I did over 3 years ago. It was one of the first pieces I did using Illustrator. I think this new one is leaps and bounds better than that older one. This one is a variation of a commission piece I recently did. 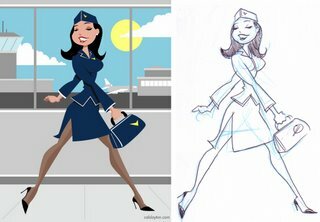 Very cool before-and-after with the stewardess. Hey Cal.. just a quick note.. I found your site through PVP. Really like your designs/style. Very cool. David - Thanks. I got the LBS synopsis, haven't ahd a chance to read through it yet. Todd - I know exactly who you are! The Good Day guy! And you know what I actually heard you on BAD Radio the other day, it was too funny! Thanks for checking out my stuff, i really appreciate it. Tell Megan hello! i want a part in next years tour-de-force!